The majestic Crazy Hotel built in 1927 is the site of the third well dug in Mineral Wells in 1881, which coined the phrase Crazy Water. When the well was completed, many people came to drink from it. Among the crowd was a woman who suffered from some type of mental disorder. The local children called her the "Crazy Lady". The legend says that after the woman drank the water for a period of time, she was cured. Thus the name Crazy Water and the Crazy Well. The Crazy Well grew into the Crazy Water Pavilion and in 1927, Carr Collins build the Crazy Hotel at a cost of $1,000,000. The Crazy Hotel contains over 200 guest rooms, a spacious lobby and incorporates the Crazy Water Pavilion. The top floor of the Hotel has a glass enclosed ballroom which opens onto a rooftop garden. 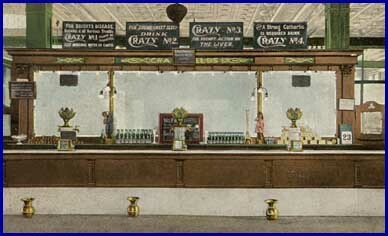 The Crazy Well Drinking Pavilion - circa ???? The Hotel has hosted numerous dignitaries to view prominent big-band orchestras. The Crazy Hotel has also been the site for weekly radio shows, weddings, galas, cotillions and dinners. Some famous and infamous guests would include Conrad Hilton, a guest at the grand opening of the Hotel; D.W. Griffith, Judy Garland, General John J. Pershing, Mary Martin, Spanky McFarland, Tom Mix and Bob Wills. A few guests who failed to correctly sign the guest register include Machine Gun Kelly and Bonnie and Clyde. For nearly a hundred years, the Crazy Hotel has served four strengths of water from its water pavilion. We no longer can claim to cure hysteria, insomnia, rheumatism, diabetes, gout, Bright's disease, malaria or high blood pressure; although we can claim to provide the most distinctive, luxurious and affordable independent retirement living in the State of Texas.